WHAT IS THE WEATHERIZATION Assistance PROGRAM (WAP)? Weatherization is the nation's largest residential energy efficiency program. Weatherization aims to reduce the energy costs of low-income families through energy-efficient weatherization measures. Weatherization specifically focuses on assisting low-income people - primarily the elderly, persons with disabilities, and families with children. High energy costs are an excessive burden on low-income families. Weatherization addresses this need for assistance. Weatherization's professionally trained crews evaluate single-family homes, multi-family dwellings, and mobile homes. 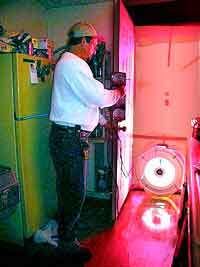 Weatherization performs energy efficient retrofits through the utilization of Department of Energy and privately leveraged funds. Reducing energy costs for families. Providing education in energy-efficient practices. Addressing health and safety concerns. Creating greater flexibility in spending choices. Helping to create an empowered community.